Ready to haul heavy loads on rough surfaces all day, every day, the Coronado SD is the new king. With a classic square grille and hood, this vocational / high Gross Combination Mass specialist is a truck that looks the business and can do the business. There's a very simple reason why we named this truck Severe Duty. That's because we've designed it from the gravel up to thrive in the toughest working conditions. And with its classic square grille and big bonnet, it'll look great doing it. 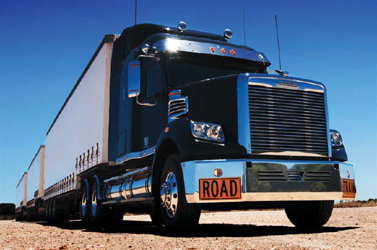 The Freightliner Coronado SD is a vocational / high GCM specialist. Carting rocks up and out of quarries, lugging steel across a busted up building site, hauling a road train through the outback - the SD can do it all. Blistering sun, pouring rain, mud, dust and dirt make no difference. If you need to haul heavy loads all day every day, then the Freightliner Coronado SD is the truck you want. 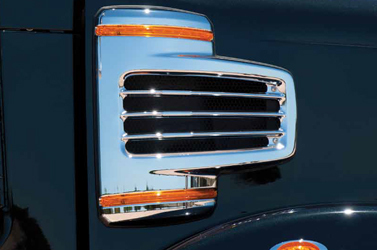 Freightliner also offers a variety of fuel tank sizes and mounting locations. To ensure you can make any pick up or delivery, regardless of the conditions, the Coronado Severe Duty comes standard with driver controlled differential locks. This off-road capability is further enhanced with optional traction control, Roll Stability Control and dual levelling valves with the optional air bag rear suspension. A generous wheel cut provides optimal manoeuvrability for tight vocational situations, and the SD's stylish headlights can turn night into day with excel lent forward and side illumination that's far superior to older, sealed beam designs. 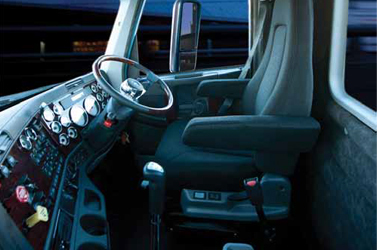 Front cab mounts using a 'pillow block' design ensure vibration and shocks are effectively dampened, while air springs on the rear mounts ensure the driver will always be able to 'feel the road'. EzyRider II high-backed seats make the ride even more pleasant, along with a fully adjustable chrome and leather steering wheel. The ergonomically designed dashboard is injection-moulded for impressive two-tone looks and additional durability. The interior also features Oregon burl wood trim, ivory coloured gauges and interior trim levels in either studded vinyl or cloth. Double seals on the doors provide superior insulation and noise reduction when you're driving. 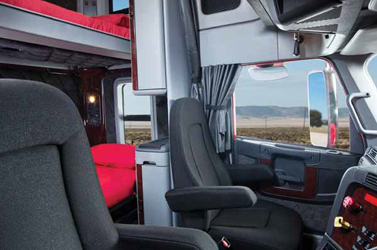 When it comes time to sleep you'll appreciate the noise abatement material that's packed into the cab's floor, front wall, sides and back panel. You’ll also appreciate the separate bunk control panel that can adjust the heater, air-conditioner and lights. There's also a stow-away bunk for extra bed space if it's needed in the 58" raised roof model. Well placed cabinets throughout the cabin provide maximum storage space. There's a TV cabinet, a clothing rack and pull-out writing surface. You’ll never want to leave. 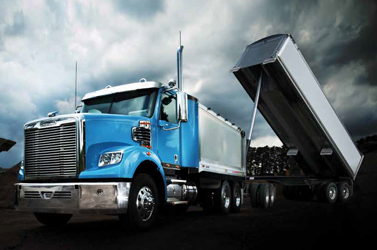 Freightliner's new Coronado SD has been designed so it can handle the toughest conditions, while you don't have to. Dirt, noise, heat and cold are kept well at bay, while the bangs and bumps are smoothed right away. There's plenty of choice, with the Severe Duty coming with five cabin variations – from a Day Cab through to the luxurious 58" raised roof dual bunk sleeper. The cabins are big as well as comfortable. They are up to 200mm wider than most and thanks to Freightliner's famous flat floor throughout there's plenty of head room as well. The air conditioning and heating system is one of the best you'll find. Safety hasn't been overlooked of course. The SD's lightweight cab is made of high-strength aluminium and exceeds Europe's stringent crash worthiness standards (ECE-R29). A simple frayed wire can stop your truck working and stop you earning, so the Coronado SD has a toughened electrical system to keep you moving. The electrical wires are bundled and attached to the frame rail, to minimise any rubbing or chaffing. The SD's E-rail technology ensures the electrical routing is safe and secure, while all wires are also numbered and colour-coded. As well, the Severe Duty features a unique electrical connection system in the cabin's front wall. 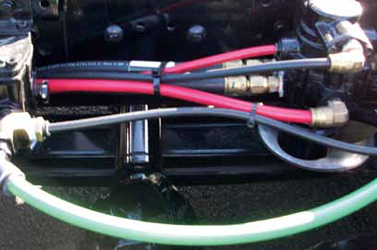 Two distinct connectors allows for more consistent wiring to further reduce diagnostic and repair costs. The Freightliner Coronado SD can breathe like an Olympic athlete, so it can per form under all conditions – heat, rain or snow. The air going into the engine must pass through a three-step intake and filter system. Air intake grilles on either side of the bonnet are designed to minimise the intake of water, dust and debris. Air then moves through pre-cleaner filters which use a vortex to 'spin out' heavy particles before moving into the bonnet plenum where it slows and dries. Next it moves through the super-efficient main air cleaner before entering your engine. The Severe Duty's giant stainless steel grille hides a massive 1,900 in radiator that's plenty big enough to keep your engine cool in the hottest summer and still has reserve capacity.